A Ketubah (the Hebrew word for marriage contract) is work of art expressing the love and commitment of marriage. 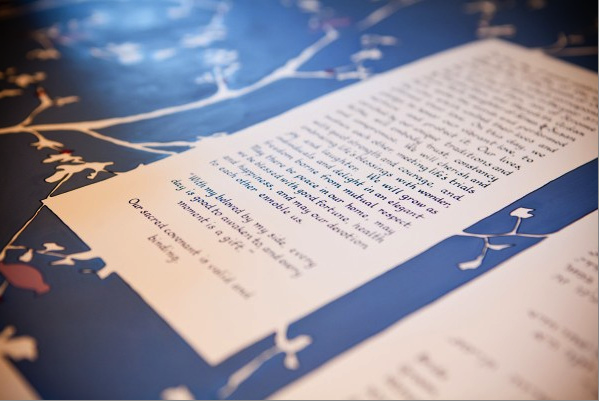 The traditional art of the illuminated ketubah – an art form with earliest examples dating back 3,000 years — is a central component of the Jewish wedding. I have over 10 years experience creating custom ketubah the world over for couples of all faiths and cultures. Octavine Illustration is an artist-owned and operated business based out of my 1880 Victorian in the beautiful hills Marin County, California, just north of San Francisco. You are working directly with the artist creating your ketubah. I do everything by hand so your ketubah will be an original work of art. I use Arches archival paper handmade in France and I ink it with a 1940s calligraphy pen using lightfast, archival ink. I use is gouache, a waterbased paint used by the Art Deco artists of the 1920s. All illustrations and fonts are hand-wrought and completely original. I create my own alphabets in both Hebrew and English and calligraph your ketubah completely by hand according to your specifications. No digital imagery or digital printing is ever used. You may either choose an image from my portfolio, called a Template (min. 6 weeks lead time), or you may commission any entirely new, custom ketubah image (min. 12 weeks lead time). I also can create synagogue honoree gifts; brit milah, bris, baby naming certificates; custom commissioned synagogue art; posters; wedding, bar mitzvah and anniversary gifts, Anniversary Ketubah or Anniversary Illumination (non-denominational). Part of what sets my work apart is the calligraphy. An art form in and of itself, one can see the hand of the artist; the human element that no computer can imitate. Every letter drawn and designed and conceived of by my brain. Calligraphy and artwork are completely integrated. My process is a centuries old art form with every aspect of each ketubah rendered entirely by hand. A Template Ketubah by Cara Buchalter of Octavine Illustration is an original, unique, one-of-a-kind work or art chosen from an existant design. All ketubahs (ketubot in Hebrew) are original paintings in gouache (a water-based paint similar to watercolor but with heavier pigment) and ink. Customized to your tastes, you may choose the color palette and add small personal details. Each ketubah is made to order. View the slideshow above for examples of my templates. I begin with a blank piece of Arches archival paper, handmade in France, draw the design to your specific tastes and paint it by hand. The text is fully customizable and calligraphed by hand. The only difference between a Custom Ketubah and a Template is with a Template you are choosing an existent design from my portfolio. Unlike most ketubahs which are printed by a computer (i.e. giclee), ALL my designs are original paintings and I never use digital imagery or printing. Another major difference is the calligraphy. Your personalized wedding vows, calligraphed by hand, in either Hebrew, English or both, are completely hand-wrought. You will be receiving a custom work of art. *Template prices range on the materials and processes involved and are $800-$1200 depending on complexity of design. *Choose from traditional or modern text or create your own vows. I’ll need wedding details about you, your parents and the ceremony. Please download this form and return via fax or email. Creation—Ketubah ready approximately 3 weeks after text approved. Hand-lettered, original paintings—custom designed in consultation with you. Choose from traditional or modern text or create your own vows. First we speak by phone or email. If you have a vision, we figure out a plan. If you have no idea, we see if I can inspire you. Then I have you send me pictures of things you like – your weddinginvitation, patterns you like, art you’re fond of, genres which speak to you, previous work of mine, other people’s work which inspires you but isn’t quite right for you, family photos or heirlooms, your china, pictures from magazines, poetry, your curtains…this gives me an idea of your tastes, and I make sketches. You provide me with your text (either standard versions or your own unique wording) in either Hebrew, English or both and I carefully create your unique work or art. Individual gouache and ink painting designed in tandem with each couple. I begin with a blank piece of Arches paper, pencil a pre-approved design we have created together, paint the ketubah with gouache, and ink your custom calligraphy text by hand. Please email me or call to order a custom ketubah. I have developed an interview process to draw out your tastes and reveal your vision. Following the interview a series of sketches are sent. Once an idea is accepted, I begin a final draft—allowing you to review each step of the process. *Prices range from $1800-$3000 depending on materials used and complexity of design. *All my designs are original paintings and I never use digital imagery or printing. You will be receiving a custom work of art. Cash or check, please. Paypal for international orders only. Orders do not include shipping and insurance. If time allows, I can do rush orders at a 20% surcharge if all the necessary information is given to me less than 30 days before the wedding. If you have any questions please see my FAQs or contact me. If you would like to see what others say about their ketubah and the process of creating a custom ketubah for their wedding, please see my BUZZ.